* Our journal has started to accept articles for the April issue. ** Our journal has started the application process to ULAKBİM TR directory. *** Our journal will assign a DOI number to every article since April 2019. **** The articles published in our journal meet the Associate Professorship and Academic Incentive criteria. *****Our journal started to be scanned in the DOAJ index. 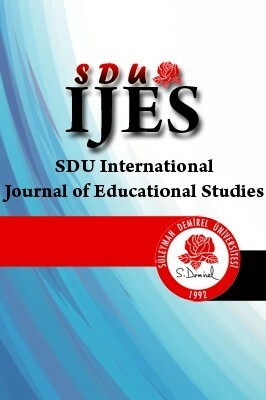 SDU International Journal of Educational Studies (SDU IJES) is published biannual as an international scholarly, peer-reviewed online/electronic journal. In this journal, research articles which reflect the survey with the results and translations that can be considered as a high scientific quality, scientific observation and review articles are published. Teachers, students and scientists who conduct research to the field (e.g. articles on pure sciences or social sciences, mathematics and technology) and in relevant sections of field education (e.g. articles on science education, social science education, mathematics education and technology education) in the education faculties are target group. In this journal, the target group can benefit from qualified scientific studies are published. The publication languages are English and Turkish. Articles submitted the journal should not have been published anywhere else or submitted for publication. Authors have undertaken full responsibility of article's content and consequences. Please use sduijes@gmail.com for journal contact.